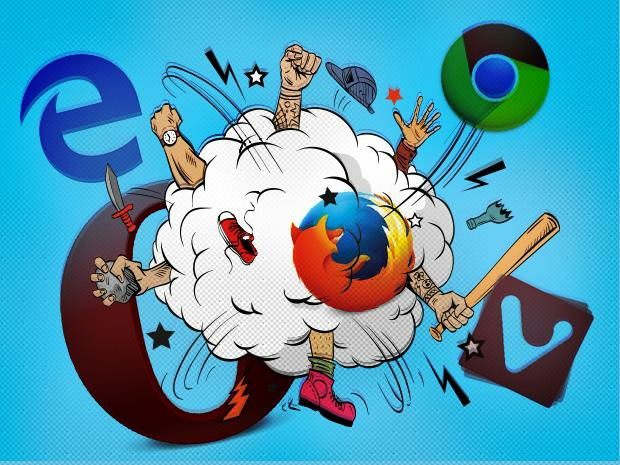 Windows 10 browser beatdown: Who’s got the edge? With about a third of all Windows traffic on the web coming from Windows 10 installs, according to figures from U.K.-based analytics firm GoSquared, and with Microsoft distancing itself from Internet Explorer in favor of the Edge just as fast as it can, it seems like as good a time as any to survey a few of the best browsing options for Windows 10 users. A word on methodology – I ran each contestant here through three benchmarks (higher scores are better in all of them – see graphic below) to give a broad sense of overall performance, and put each of them through their paces by using them for both work and play. With the exception of the benchmarks, what follows are the subjective opinions of a working reporter who nevertheless does a great deal of web browsing. The five browsers – note that Apple Safari isn't a real option on Win10 -- are presented in reverse order of preference, with my least favorite first. Enjoy. I have Microsoft Edge as a secondary browser (my super high-tech solution for having both my private Twitter and my professional Twitter open at the same time is to have them up in two different browser windows; yes, I know there are slicker ways to do this) and I spent a few frustrating minutes trying to figure out how to uninstall it, before I realized that Edge is embedded firmly into the guts of Windows 10, and that it’s not really something you install and uninstall. In fact, it turns out that you literally can’t get rid of it, even if you really want to. Getting into a full-fledged examination of user freedom and choice, and the precise philosophical reasons that it’s stupid and invasive to take away users’ control of the software that runs on their own computers isn’t really the point of the article, but I can’t just elide the issue, either. The argument that Edge and Cortana are just so integral to the basic functionality of a desktop OS is silly – if a web browser and a voice/search assistant really are key underpinnings of the entire structure, that’s ridiculous design. If they’re not, stop pretending they are and let me get rid of them. Benchmark-wise, it’s not terribly impressive next to Chrome and the two other Chrome-based browsers in our comparison, though I didn’t find it to be noticeably less responsive than any of the rest in standard usage. The interface is highly Metro, with all that that entails – menus are simplified, everything looks kind of blocky and stripped-down. If you enjoy the Metro visuals and method of interacting with software, you’re going to like Edge. If you hate it like poison, you probably won’t. I’m Metro-agnostic, personally – I think Edge is visually attractive, but I’m less than crazy about the way the menus are structured along the side of the window. It’s at the bottom of the rankings not because it’s a bad browser, but because I can’t think why you’d use it instead of the other browsers on the list – the ability to draw on a page with web notes is neat, but sharing is a bit clunky and you have to use Metro apps to do it. The interface is good enough, it’s nice to look at, but I’m going elsewhere for my everyday browsing, thanks. Increasingly the web’s default browser, Chrome’s been my daily driver for about six years. (I was a Firefox guy for probably five years before that.) Thusly, it’s a little tough to talk about as anything but a baseline for me, but I’ll take a stab at it. Installation is very quick indeed, though I dislike the checked-by-default “make Chrome my default browser” box in the installer – more on principle than anything else. There are far more insidious checked-by-default boxes in other web installers – Java’s infamous partnership with the Ask Toolbar is a good example – which, because people have learned to click straight through these things so quickly, amount to an attempt to sneak something past our overloaded attention spans. But where browsers are concerned, of course, it’s hardly an unusual feature, and it’s not difficult to fix the problem if you thoughtlessly click past it without meaning to. Like Firefox, Chrome appears to retain settings, extensions and even history unless you tell the uninstaller otherwise. Chrome Extensions let you add a huge array of new capabilities to the browser, and are characteristically simple to search out and install. That’s what Chrome’s all about – simplicity. Google’s browser is streamlined, fast and intuitive. It’s childishly easy to set up, import your bookmarks, and get to browsing. Because that’s what Google wants you to do. Google’s apparently less interested in making it easy for you to dig down under the hood to change meaningful things about the way Chrome works, however – that’s time you could be spending providing useful ad targeting data to the Great Machine God having a great old time on the internet. Some – admittedly fairly advanced – settings are hidden in the ://flags page, and the main settings tab has the feel of an afterthought. I was going to say something along the lines of “that’s probably OK for the rank and file of internet users,” but what the heck do I really know about what the average internet user wants, or whether there is even such a thing as an “average internet user?” The bottom line is that Chrome is fast, dependable and easy enough for even deeply untechnical people to get accustomed to. But if you’re a more advanced user who likes to tinker, it can be frustrating. Firefox’s installer is less pushy than Chrome and Edge – it doesn’t badger you about making it the default browser. It does appear to leave residual settings somewhere on your machine when you uninstall, however, as my bookmarks and add-ons from a previous install reappeared after reinstallation with no prompting from me. That said, the experience of using Firefox is closest to what I think of as a more traditional web browser – it’s nicely customizable, there’s a broad library of add-ons, and it just works, in much the way that Chrome does, though it’s easier to dig into the settings in a more granular fashion.